child to a one-of-a-kind party in his or her honor! •FREE Gift for the Birthday Child! We set up, clean up, and make it our priority that everyone has a great time! plus an additional 30 minutes of guaranteed FUN! This extension on the Treetop Party includes an added 30 minutes of your choice of ONE art & craft activity. 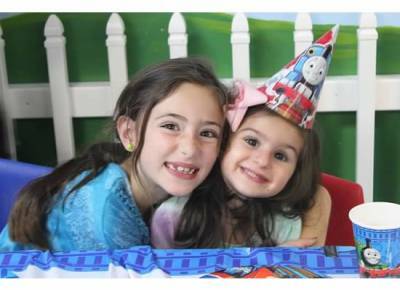 •Decorate your own FRAME (Each child can customize their own using colors they love) Includes a 5x7 photo. Everybody loves a new friend! Perfect for all ages and genders, this NEW Stuff-a-Friend party will be a favorite among your guests. Kids will choose from a variety of animals, fill their new friends, and walk away with a new buddy to play with! Each animal will be packaged in their own special carry out box or bag! Great for kids of all ages! During this 30-minute add-on, the birthday child and his or her friends will become a graceful flock of swans and strong princes and take a special ‘Swan Lake' ballet class. 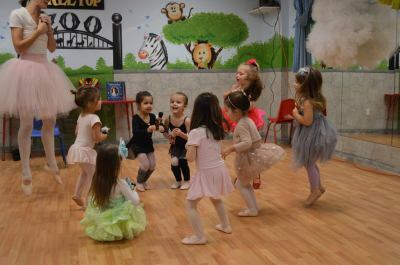 Baby Ballet Long Island’s experienced teachers will guide the dancers through a short ballet class to warm up. The birthday child will then be transformed into the Princess Swan complete with Tiara or Birthday Prince complete with crown and his or her friends will become swans and princes, and dance to the famous music we all know and love. Recommended for ages ‘walkers’ to 5 years old and parties of up to 15 children. Parties with more than 15 children may be subject to an additional fee. Soccer Shots® is a uniquely designed program that will introduce soccer to your child in a fun, safe and controlled environment. 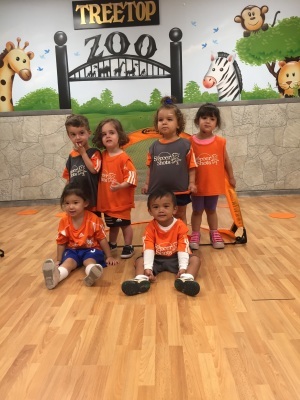 During a fun-packed 30 minutes, experienced and enthusiastic instructors focus on having fun while guiding children through imaginative games that teach basic soccer skills. Our instructors are energetic and enthusiastic, are great teachers, and love working with children. Character development, physical skills, and fun are guaranteed in Soccer Shots! Soccer shots is recommended for children ages 3 to 7 years & and for parties with less than 15 children. The following ADD-ONs are also available to make your party EXTRA special! Enjoy an extra half hour of excitement in The Treetop’s Little City! *Only available for the first and last party of the day! Costumed Characters Ask us for our recommendations! 7 inch plates, 9 inch plates, cups, napkins, color coordinated tablecloths, 2 mylar balloon centerpieces, assorted tattoos! Lots of fun at a great price! Ask about available themes. *Please note that party theme packs are based upon availability. NO OUTSIDE THEMED GOODS WILL BE ALLOWED. Fun-Filled Pull-String Pinata Pinata: $50.00 Various themes available! 18 inch Mylar Centerpiece includes 3 Latex balloons: $9.99 Available in many themes. Enjoy a variety of Treetop retail items at 20% off! Pick any items in our toy boutique and we will gift wrap them FREE for you! They will be ready and waiting the day of your party! Many great choices available! Ask us for suggestions! To download our free prinatble invitations, birthday packages flyer, and full catering menu, click on the links below!